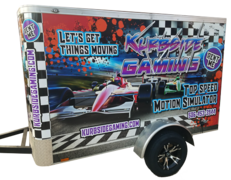 Kurbside Gaming Trucks (The Game Changer & The Kurbside) are pure excitement packed with excitement delivered to your door, place of business, school, church, corporate event or trade show. Our custom Mobile Gaming Theaters are packed with awesome features such as luxurious limousine styled interiors, colorful ambient led accent lighting throughout, giant sized HDTV’S system linked to Xbox 360, Playstation 3, and Wii video game consoles. Of course thats where the excitement begins as the included “Game Coach” keeps the special event rockin and rollin while you can relax and concentrate on your guests. Each gaming truck (The Game Changer & The Kurbside) offers huge gaming couches to accomodate up to 24 players at a time for the upmost in comfort. Air conditioned and heated interiors complete the experience for a year round option of providing entertainment venues at any location desired. This is a true Video Game Bus on wheels with over 100 of the latest gaming titles available its sure to be the hit of your birthday party, graduation, senior all night party, church picnic, fundraiser, pizza party, cub scout event, wedding, bar mitzvah. Call today and speak to a party planning professional to go over our other services such as bounce house, inflatable game rentals, concessions, tents, tables, chairs that can be added to your game truck rental to complete the experience! For your convienience we offer a one stop and have one of the largest event rental inventories in South Eastern Michigan proudly serving the metro detroit area for the past 12 years.